RBR found that faced with rising operating expenses and falling foot traffic in branches, banks in developed markets are streamlining their branch networks and turning to off-site ATMs as a more cost-efficient customer service channel. In newer markets, banks often see ATMs as a less costly alternative to branches, the RBR study noted. In countries with large rural populations, where it would not be feasible to open a branch in each small town or village, the ATM is often the first and only physical point of contact between banks and their customers.For example, in the Netherlands, financial institutions closed 900 branches between 2011 and 2015. During the same period the nation gained 800 off-premises installations. In such markets, off-premises ATMs serve to increase financial inclusion and allow banks to compete for new customers. ATMs can be a lucrative revenue generator as well. A well-chosen location in a busy area can attract high transaction volumes, bringing in surcharge and interchange fee income for operators. 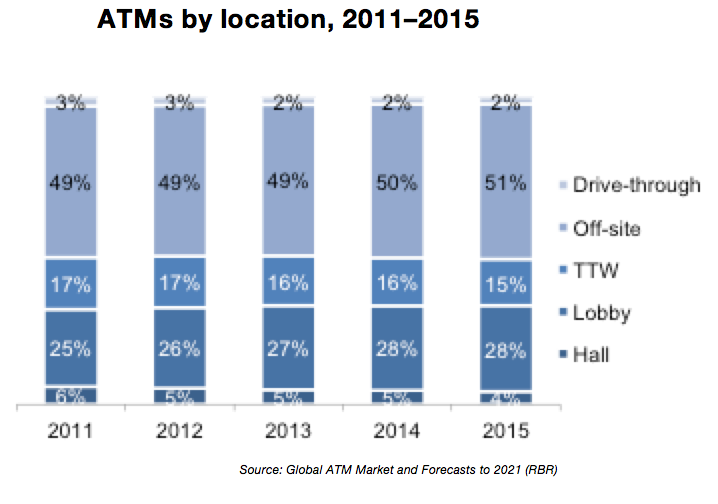 In these profitable locations, banks often find themselves competing with independent ATM deployers for market share, RBR said. IAD terminals, the majority of which are installed in non-branch locations, now account for 16 percent of ATMs globally. RBR has forecast most markets, with the exception of China, with nonbank deployers will see the IAD share grow over the next few years. In China, where IADs deploy on behalf of partner banks, their share will fall as banks increasingly take control of their own off-site ATMs, RBR said.